Visitors used to be able to drive down the beach to the crash site, but on March 2016, local landowners banned access to vehicles driving on the beach. Now, you have to walk 2.5 miles to get to the wreckage. The actual walk isn’t bad, but it is very long and you get pretty tired on the way back. Iceland is also notorious for crazy weather changes, so you have to factor in rain or snow when walking to the site. Make sure you’re prepared. There really isn’t a sign on the road to the plane crash, so you’ll need to keep an eye out for some parked cars once you’re in the area. It's 10 minutes from the Skógafoss waterfall or 18 minutes from Vik. If you are using your phone as a GPS, Google Maps points out the plane wreckage site. Once you park, you’ll see a sign that says "Closed", blocking any vehicles to enter the beach. There is another sign that says the plane crash is ahead on the beach and to follow the markers, which you will see to the right of you. We followed some people in front of us and they were walking to the left of the markers. The walk there wasn’t bad as we were prepared for the long walk. I read so many reviews that this was a horrendous walk and even experienced hikers had trouble walking this, but I have no idea what they were talking about! This walk was a breeze compared to hiking (I’d like to note that I’m a terrible hiker. I can’t even go up half a mile before I start running out of breathe). If you experience bad weather, I can see how this would be a struggling walk, but otherwise, you’ll be fine. It’s just long and takes about 45 minutes one way. I was also worried that we wouldn’t be able to find the path, but you literally walk straight ahead after you park and there’s usually people there you can follow. We got there around 5pm and there were always people in front and behind us on the walk there and back. When we got to the site, the plane was stunning. The wreckage is both amazing and eerie. You feel like you're experiencing some sort of apocalypse as you explore the inside of what remains in the plane. I love history and artifacts, so it was such an adventure for me. There were about 10 people there when we arrived and you have plenty of opportunities to take pictures of the plane on it’s own. We’re so glad we visited this site and highly recommend everyone to visit! 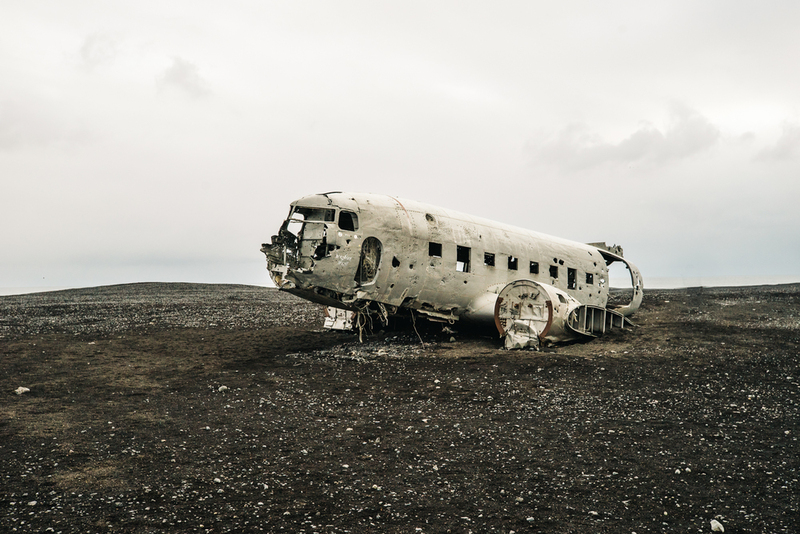 The Solheimasandur Plane crash - amazing! !